I believe in "Every child can!" but to be frank I also believe that some children do their job better than others. Undoubtedly a better progress roots in a diversity of reasons and factors. Certainly the first and the most important element which includes many different subdirectories by itself is "Environment". Environment can grow a noble character who has got all merits of the world or one that cannot be called a human kind. 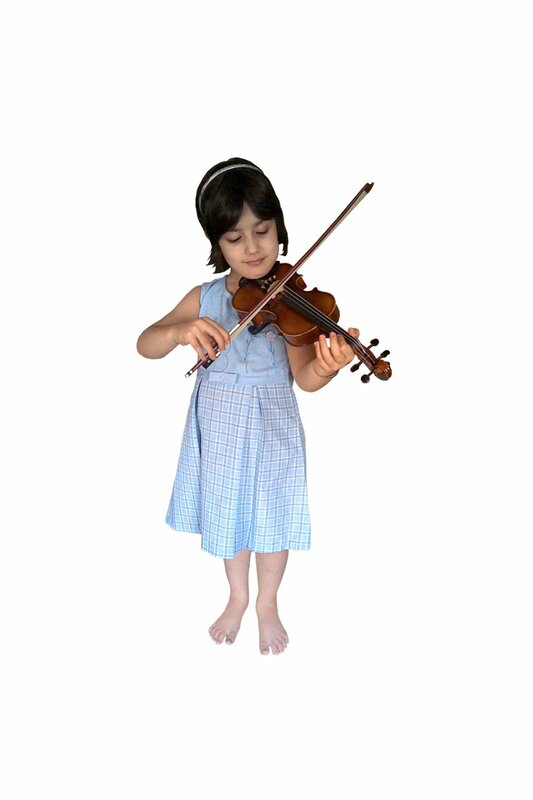 It is the same story in violin learning. Different atmospheres make different advantages. I'd better elaborate this through a clear example to make my point easily. The picture above is Romina. In a very short time she's learned so much. I've been teaching her less than three months but she holds her violin comfortably like an experienced violinist and plays her songs beautifully. She even believes that it's easy to play the violin. Yet I have pupils who think that playing the fiddle is the most laborious job in the universe. Where do these beliefs and statement-which are true productions and also constructors of our beliefs- come from? Romina's parents -specially her kind-hearted mum- observe daily rehearsal of their daughter responsibly. Sometimes her mother asks me questions about the new lesson or it's related technique on violin that surprises me because I had never heard such a question before from other students or their parents. I enjoy to answer patiently and I understand that these parents have found the right way through success. I would have wished to have such parents!!! But for non musicians, they have done their very best! Yes so true that environment is important. Especially for kids who can't take charge of themselves alone. For one thing, kids usually don't discover the violin world alone. They must have people who do some around them to have the idea that: hey, I could play violin too! But with environment must come passion. If a kid doesn't really like it... chances are he/she will not play as an adult even if his parents paid him/her good lessons and tralala. The teacher is important too. Every child can play the violin if the student, the teacher AND the parent are all working together. Yes, especially for the young, parent involvement is SO important! It's both an exciting and sobering thought, though, that as soon as I start with a new student, I become part of that child's environment. His or her growth is now, at least in part, shaped by me. Sometimes I may feel like I'm making no difference whatsoever, but eventually it will come out, for good or for bad. I have seen that so clearly in my teaching this year, especially some students who have been strugglers for one reason or another. Some it's personal issue, or a learning struggle, or a family who's not supportive. Some it's specificaly violin-related; others it's a larger part of their personal life. Little by little, as they come into lessons, I can see a difference. More confidence--more order--more ownership--more discipline--more group effort with fellow orchestra members--more personal interpretation of ideas. But then once in a while also, I see a tenseness or a weakness and suddenly realize that it too is something I've built in. What an opportunity and a stewardship we have to make a difference--in music and more than music. Parental involvement and support are extremely important for young students. I've written a letter to the parents of my new students in which I tell them this and suggest ways that they can help, even if they are not musicians. I posted my draft of the letter in my blog on v.com and received some helpful feedback from my fellow v.commies. I agree with Kathryn that teaching music is a very valuable act by itself, but it can be valuable in other ways. If we form trusting relationships with our students, we can give them empathy and counseling, too.